Personal Name Stamp: Good Characters’ top selling stamp with hundreds of Excellent-rating feedbacks. This personal name stamp is custom made with the translation of your name into Chinese characters, also known as Japanese kanji or Korean hanja. The translation will match your personality, values, and interests if possible. You’ll be ready to stamp your unique signature on cards, books, notes, certificates, or anything you like. This high quality stamp is completely self-contained in European made impact-resistant, durable case that assures a long, trouble-free operating life. This stamp is guaranteed to make thousands of clear impressions before the first ink pad ever needs replacing. It re-inks itself after every stamping. Custom crafted by Good Characters in Central California; order now and we will deliver it within 7 days. Good Characters’ top selling stamp with hundreds of Excellent-rating feedbacks. Good ways to use your stamps: Mark your books, personalize your notes, sign your artwork, authenticate documents, impress your clients. 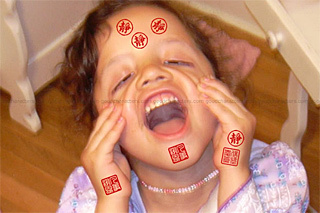 Wrong ways to use your stamps: Stamp on faces or karate chop it. Don’t stamp on your face or, even worse, your friends’ faces. And, okay, this is actually a composite image. No children were harmed in any way in the shooting of this picture! You and your name will stand out in their mind above your competitors. And who knows . . . they might even give you a “real” stone-carved seal for a gift. Happily accept the gift, knowing they appreciate you as more than just a business associate. Just don’t tell them that Good Characters’ self-inking stamp is a lot easier to carry and use. Some of your Asian clients might suggest that the “traditional” stamp should be made with carved stone or wood. This begins a good conversation, allowing you to show that you respect the Asian culture but are not trying to show-off as if you know it all. You give your clients a chance to introduce their culture. You and your name will stand out in their mind above your competitors. 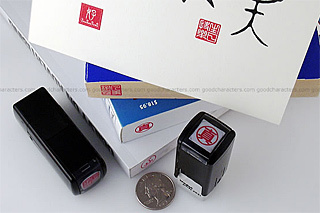 Business professionals dealing with Chinese, Japanese, or Korean clients use Good Characters stamps to show their appreciation of Asian culture and build positive rapport. Using a stamp made with a careless name translation may backfire, leaving a wrong impression. With Good Characters’ personal name translation, your clients will be impressed by your name and assume that your services are of first-class quality and you have expertise. Authenticate Documents: Martial arts instructors and other Asian culture-related art or medical professionals authenticate certificates they issued with Good Characters stamps. A typical martial arts ranking certificate contains a school stamp (Dojo Certificate stamp), an instructor stamp (Martial Arts Master stamp), and a security stamp. Sign Your Artwork: More and more artists doing Chinese painting with watercolor prefer Good Characters stamps over traditional soapstone seals because the Good Characters stamp leaves a clear impression even on hard paper. Personalize Your Notes: Use the stamp as a personal logo or a mysterious signature for personalizing your notes, memos, greeting cards, or letters. Mark Your Books: Stamp on the spine or closed pages of your books to make it unquestionably yours. The ink-pad that comes with your stamp contains special indelible ink that has met German Standard DIN ISO 14145-2. That’s why your stamp will make clear and non-erasable marks on your books and will remain legible for years and years, even if subjected to direct sunlight. Karate Chop It: Simply hold the stamp with one or both hands and gently push the stamp down to make a clean and clear impression. Using excessive force, such as karate chopping, to leave an impression may cause harm — not to the stamp but to your palm — and thus is not recommended. Enter the name to be translated into Chinese, Korean, or Japanese. If you already know the characters you want, you can also enter them here, or you can email the text or image to us at info@goodcharacters.com. If you need translation, this information helps us translate a name that is most appropriate for you. Tell us a bit more about yourself so we can translate a name and design a stamp that reflects your unique personality. For example: Personality or interests? What else would you like us to know about you?